Tunisia signed the Conventions on 5 May 1957, Additional Protocol I (Protection of Victims of International Armed Conflicts) and Additional Protocol II (Protection of Victims of Non-International Armed Conflicts) on August 9, 1979. Moreover, Tunisia became signatory to the Convention for the Rights of the Child (CRC) on 30 January 1992, as well as the Optional Protocol to the CRC on 2 January 2003. Tunisia has been member of the OIC since 1969, and ratified all eight fundamental ILO conventions. On October 24, 1957 it became successor to the Convention and Protocol. Succession, in relation to multilateral treaties, means the State expressed its consent to be considered as bound thereby. The Convention on the Elimination of All Forms of Discrimination against Women – also called CEDAW, was approved during the General Assembly Session on 18 December, 1979 and entered into force on 3 September 1981. Tunisia signed the Convention on 24 July 1980, and ratified it on September 20, 1985. Countries that have ratified or acceded CEDAW are legally bound to put its provisions into practice, and thereby agree to submit national reports on measures taken to comply with its obligations. Such reports are to be compiled at least every four years. Along with its ratification, Tunisia made apparent a number of reservations; stating provisions of Chapter I of the Tunisian Constitution trump the Convention in case of a conflict between the two. Specific mention was made of Article 9 (2), concerning children’s nationality – not adhered to if it conflicts with Chapter VI of the Nationality Code. Tunisia does not consider itself bound to Article 16, 1c, prescribing the same rights and responsibilities during marriage and upon dissolution; 1d, listing the same rights and responsibilities of parents regardless their marital status; and 1f, granting equal rights and responsibilities regarding guardianship, wardship, trusteeship, and adoption; and holds reservations towards paragraphs 1g, prescribing equal personal rights, including that of choosing a family name and profession; and 1h, granting equal rights to spouses pertaining to property ownership – stating it must not conflict with provisions of the Personal Status Code. Additionally, the country is not bound to Article 29 (1), discussing dispute between states concerning interpretation or application of the Convention. It is noteworthy that Article 29 (2) specifically allows for such a reservation. Additionally, Tunisia declared regarding Article 15, paragraph 4 – prescribing equality in freedom of movement and domicile – that it must not be interpreted in a conflicting manner to the Personal Status Code chapters 23 and 61. The Convention on the Rights of Persons with Disabilities was approved during the General Assembly session on December 13, 2006 and came into force on May 3, 2008. Simultaneously, the Optional Protocol was approved, giving the Committee on the Rights of Persons with Disabilities (CRPD) competence to examine individual complaints with regard to alleged violations by States parties to the Protocol. The CRPD is the body of independent experts that monitors implementation of the Convention. Tunisia signed both the Convention and the Optional Protocol on March 30, 2007 and ratified both on April 2, 2008. No reservations were submitted. The Convention against Torture and Other Cruel, Inhuman, or Degrading Treatment or Punishment, also referred to as just the Convention against Torture, was adopted during the General Assembly session on December 10, 1984. On June 26, 1987 it was registered and thereby came into force. Its implementation is monitored by the Committee Against Torture(CAT), composed of ten individuals of various nationalities. All signatory states are obliged to send regular reports to the CAT, based on which recommendations are made. Tunisia signed the Convention on August 26, 1987 and ratified it on September 23, 1988. Upon ratification, it completely withdrew the reservations made upon signing which were related to Article 21 and 22 listing the competencies of the Committee. The International Convention on the Protection of the Rights of All Migrant Workers and Members of their Families was approved by the General Assembly on December 18, 1990 and entered into force on July 1, 2003. Tunisia is not party to the Convention. Tunisia signed the Convention on April 12, 1966 and ratified it on January 13, 1967 with no reservations. 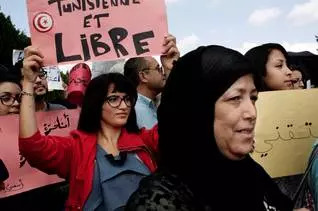 Since the overthrow of the Ben Ali regime, Tunisia has advanced human rights in several fields: a pluralistic election law was adopted, leading to relatively free and fair Constituent Assembly elections in October 2011. People are now allowed to establish political parties and stand for election, and peaceful demonstrations are permitted, although the police has responded to some with disproportional force. In addition, freedom of the media has been promoted, and, following the revolution, Tunisia has seen several new media outlets pop up, including English-language outlets. Yet, this initial freedom has recently been increasingly challenged, as attacks on journalists and restrictions on the media have increased. Another major challenge to human rights remains the continuing need for an independent judiciary to guarantee fair trials and application of the law. In the past, the regime’s control of the judiciary was a major contributor to human-rights violations. A major disappointment for human-rights advocates is that Tunisia’s new Constitution will not include an explicit reference to international human-rights laws and treaties. Instead, it refers to Tunisia’s ‘cultures and principles of human rights’, a vague expression that leaves much room for interpretation. And, although it does not include explicit reference to the Sharia (Islamic law), the Constitution stresses the importance of Tunisia’s cultural heritage and its Islamic values, which has led some observers to conclude that this provision might lead to a de facto implementation of Islamic law. In fact, while the criminalisation of blasphemy is not enshrined in the Constitution, blasphemy trials have increased recently – considered the most serious threat to freedom of expression. The emphasis on Islamic values in the Constitution has also brought into question the position of women in Tunisian society. An article referring to the ‘complementary’ rather than the ‘equality’ of gender relations might be included in the Constitution, in what many see as a direct threat to women’s rights.